Over the moon right now. Our crazy boy Nikitos (Raven's Tot Morning News) went over all expectations that we had. In addition of wining junior class and getting title Junior Nordic Winner 2016, he went all the way to the BOB, catching also adult title Nordic Winner 2016!!!! Our Sandra (Raven's Tot Keen Sensation) was 2nd Best Female with CAC. 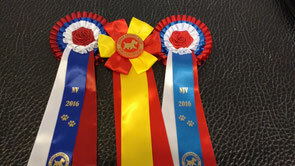 Huge thanks to the judge Saija Juutilainen for appreciating our dogs so high!